For the Michigan politician, see Martha G. Scott. Martha Ellen Scott (September 22, 1912 – May 28, 2003) was an American actress. She was featured in major films such as Cecil B. DeMille's The Ten Commandments (1956), and William Wyler's Ben-Hur (1959), playing the mother of Charlton Heston's character in both films. She originated the role of Emily Webb in Thornton Wilder's Our Town on Broadway in 1938 and later recreated the role in the 1940 film version for which she was nominated for the Academy Award for Best Actress. Scott was born in Jamesport, Missouri, the daughter of Letha (née McKinley) and Walter Alva Scott, an engineer and garage owner. Her mother was a second cousin of U.S. President William McKinley. The Scott family remained in Jamesport until Martha was thirteen years old when they moved to Kansas City, Missouri and eventually to Detroit, Michigan. Scott became interested in acting in high school, an interest she furthered by attending the University of Michigan, earning a teaching certificate and a Bachelor of Arts degree in drama in 1934. Scott received a career boost right out of college when she appeared with the Globe Theatre Troupe in a series of Shakespeare productions at the Century of Progress world's fair in Chicago in 1934. Following that she moved to New York City, where she found steady work both in stock stage productions and in radio dramas. In 1938 she made her Broadway debut in the original staging of Thornton Wilder's play Our Town as Emily Webb, the tragic young woman who dies in childbirth. Two years later Scott reprised the role of Emily in her film debut when Our Town was made into a movie. Her critically acclaimed performance earned her an Academy Award nomination for Best Actress. Scott found steady movie work for the next four decades, appearing in major epics such as The Ten Commandments, Ben-Hur, The Desperate Hours, and Airport 1975. Charlton Heston was a frequent co-star with Scott on both stage and screen. As she told an interviewer in 1988, "I played his mother twice and his wife twice. I was his mother in Ben Hur and The Ten Commandments. I was his wife on the stage in New York in Design for a Stained Glass Window and The Tumbler in London." In 1968, Scott joined Henry Fonda and Robert Ryan in forming a theatrical production company called The Plumstead Playhouse. It later became the Plumstead Theatre Company and moved to Los Angeles. The company produced First Monday in October, both on stage and on film. Scott co-produced both versions. Her last production was Twelve Angry Men, which was performed at the Henry Fonda Theatre in Hollywood, California. Martha Scott first began appearing in TV roles in the medium's early days. Her first role came in 1950 on The Nash Airflyte Theater, followed by several guest appearances on Robert Montgomery Presents and other shows of television's "golden age", including two episodes of Alfred Hitchcock Presents. This pattern of guest roles continued through the 1960s with appearances on Route 66, Ironside, and The Courtship of Eddie's Father among others. In the mid-1950s, Scott was the narrator for Modern Romances, an afternoon program on NBC-TV. Scott was also a frequent TV guest star in the 1970s. She had recurring roles as Bob Newhart's mother on The Bob Newhart Show, the mother of Colonel Steve Austin (Lee Majors) on both The Six Million Dollar Man and The Bionic Woman as well as Patricia Shepard, Sue Ellen and Kristin's mother on Dallas during its early years and later during the 1986 season. Scott was cast in single episode guest appearances on several hit shows of the era like The Sandy Duncan Show, Columbo: Playback (1975), The Mod Squad, Marcus Welby, M.D., and The Love Boat. She played the role of Jennifer Talbot, Terri Brock's nasty grandmother on General Hospital for six months (1986–1987) which ended when her character was murdered and stuffed in a drain pipe. In the 1980s she had a regular role on the short-lived series Secrets of Midland Heights and appeared in several television movies and single-episode shows such as Magnum, P.I., The Paper Chase, and Highway to Heaven. In the late 1980s, she and Jeffrey Lynn acted in an episode of Murder, She Wrote, which was a direct sequel to their 1949 feature film Strange Bargain. Scott's final acting role on television was in 1990 in the movie Daughter of the Streets. Martha Scott was twice-married, first to radio producer and announcer Carleton William Alsop from 1940 to 1946, and then to jazz pianist and composer Mel Powell from 1946 until his death in 1998. She had one child with Alsop, son Carleton Scott Alsop, and two daughters—Mary Powell Harpel and Kathleen Powell,—with her second husband. According to her son, Scott, his mother never forgot about her childhood hometown, using the mental image of a Jamesport cemetery in preparation for her Oscar-nominated role in Our Town. 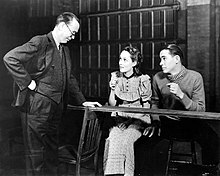 Said Alsop, "She told me she used that place as her image because it's so serene and beautiful" and that her deceased McKinley and Scott relatives "became the Gibbs and the Webbs in the play". A Democrat, she supported the campaign of Adlai Stevenson during the 1952 presidential election. Martha Scott died on May 28, 2003, in Van Nuys, Los Angeles, aged 90, from natural causes. She was interred next to Powell in the Masonic Cemetery in her native Jamesport, Missouri. For her contribution in the theatre, Scott has a star on the Hollywood Walk of Fame at 6126 Hollywood Boulevard. ^ Thise, Mark (2008). Hollywood Winners & Losers A to Z. Limelight Editions. p. 158. ISBN 978-0-87910-351-4. ^ a b Martin, Douglas (May 31, 2003). "Martha Scott, Original Emily in 'Our Town', Dies at 88". New York Times. Retrieved November 12, 2015. ^ a b c "Oscar nominee Martha Scott of Jamesport". Daviess County Historical Society. April 20, 2004. Archived from the original on December 16, 2010. Retrieved August 2, 2012. ^ "B.A. Degree". The Havre Daily News. March 24, 1944. p. 3. Retrieved June 28, 2015 – via Newspapers.com. ^ Thalman, Jane (November 1938). "Starring on Broadway, the Career of Martha Scott". Anchora. LV (1): 29. ^ a b "Actress Martha Scott Dies, Aged 90". Breaking News. May 31, 2003. Retrieved August 2, 2012. ^ Scott, Martha (December 26, 1974). "1975 Hope: Rebirth of Theatre". Arcadia Tribune. p. 11. Retrieved June 28, 2015 – via Newspapers.com. ^ Mercer, Charles (August 11, 1955). "Martha Scott Typifies New TV Gimmick—Narrator". The Kokomo Tribune. p. 57. Retrieved June 28, 2015 – via Newspapers.com. ^ Champlin, Charles (September 21, 1989). "Martha Scott Travels from 'Our Town' to Tinseltown". The Los Angeles Times. Retrieved August 2, 2012. ^ "Martha Scott". Hollywood Star Walk. Los Angeles Times. Retrieved November 12, 2015. ^ "Those Were the Days". Nostalgia Digest. 43 (2): 33. Spring 2017. ^ Kirby, Walter (May 24, 1953). "Better Radio Programs for the Week". The Decatur Daily Review. p. 48. Retrieved June 28, 2015 – via Newspapers.com. Wikimedia Commons has media related to Martha Scott. This page was last edited on 9 March 2019, at 18:38 (UTC).